This site is about web programming, code, design and UI. The default browser tooltip is already in place. However, it doesn’t look so good. So let’s go ahead and create our own. You may be thinking, why create something that has been done by many in the past? Why not just use a plugin like jQuery UI? Why reinvent the wheel? I always feel that developers write code to hone their skill. The more you write, the better you get. There may be hundreds of plugins that take care of this functionality – and most likely they are going to be better than what we build. But that’s what’s important here. To me, it’s the act of building and writing code. Knowing what’s going on under the hood. Gaining the knowledge it takes to understand how things work. I guess my point is, we’re building our own tooltip – to learn how. That’s all. First of all, we need to get all the links in the page. We have a simple utility called “document.links” – which returns an array of links! What a way to get started! Let’s go ahead and create a wrapper for our code. The above is also known as an “Immediately Invoked Function Expression“. This code is immediately run as soon as the page is loaded. It’s similar to jQuery’s “document.ready()” handler. Now it’s time to grab all the links in the page. Notice that we’re simply doing a “for” loop, and checking if the link has a “title” attribute. We then bind two functions to our links using “addEventListener()”. One during “mouseover” and “mouseout”. The functions are named “createTip” and “cancelTip” (which we haven’t created yet). Know that “addEventListener()” is similar to jQuery’s “.on()”. The trick is to remove the “title” attribute, and putting it in a temporary location (like another attribute). This way we can retrieve it for later use (like for our own tooltip and putting the title back). Let’s continue building the tooltip. Now that we got that out of the way, and we have both functions in place, it’s time to build our tooltip. In summary, we need to create a div, add our text inside and put it inside the body of the HTML. tooltipWrap.appendChild(document.createTextNode(title)); //add the text node to the newly created div. Notice the new DIV we’ve created and added our class “tooltip”. This allows us to style our tip – which is why we’re doing this in the first place. We then append our text inside the div using .createTextNode() and .appendChild(). Finally, we insert the new DIV right underneath the BODY tag. We do this by finding the first child of the BODY element, then we do a “insertBefore()” it with our new DIV. But wait, our DIV is in place – but it’s all the way at the top! We continue below by positioning our tip. Now this is probably the trickiest part of the code. It also depends on how you want the tooltip to appear, so you must adjust accordingly. In my case, I want the default position of the tip to be right above the link I’m hovering. Plus the tips have a little arrow pointing down – so we need to make room for that as well. First, let’s plugin some styles so we get a better idea of how much to adjust. I wanted my tooltip to have a darker background, with a slight orange font color. You will also notice a :before pseudo class. This is to create the “arrow” that’s pointing down. Now that we have our styles, we know how much to adjust. The top and left properties is the X and Y coordinates (or where it is in the window), plus the height and width. We need the height to calculate and offset our tip. As I was saying, we simply calculate the position of our tooltip by offsetting based on where the link is. We also add some padding and take in account the height of the tip. 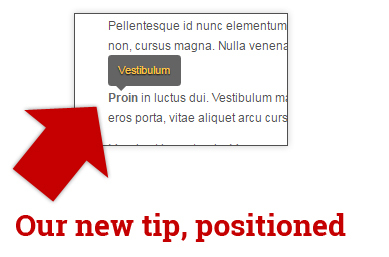 We add this new position to the tip by adding an inline “style” with “top” and “left”. Now hover over a link and you should see our newly styled tip, positioned nicely above the link. This is probably the simplest tooltip we can build. There are plenty of things to consider – such as image links, or positioning the tips below or to the left or right. These things we can add as an enhancement in the our next session. I will also build a Git repository and a demo in my next tutorial – so stay tuned. The tooltip’s position seems to be off. I came to this article looking for a way to fix the scroll issue for tooltips. Do you have a way you can recommend to fix the position of the tooltip popup with the element it is showed up on. 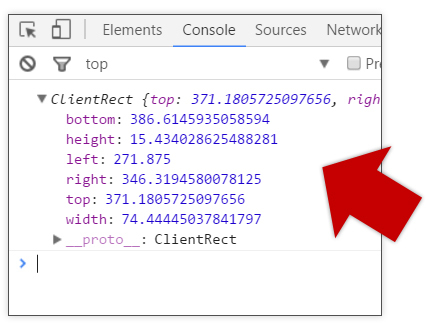 Right now, if you make the browser small enough to have scrollbars, tooltips seemed fixed to their DOM position rather than the highlighted text’s position. Also is their a way to update the position based on browser’s view port? If the page has been scrolled, the tooltip shows up offset from the link. In other words, the tooltip seems to be anchored to the links original position. This is true in Safari, Firefox, and Chrome. Don’t know about windows only browsers. You can see for yourself here: https://codepen.io/alihesari/pen/jagGOr Just make your window small enough that the text at the bottom can be scrolled and watch what happens with the tooltip. Thanks for your nice article , Can we see how the full js code looks please? Can we see how the full js code looks please? I like tooltips as it is made by java script and css and java script is my favorite language . Thanks for sharing here such nice tools system here . Hopefully more new collections will be continued through regular sharing in this site .